Mná 2016 was launched on Nollaig Na Mban. Áine Ní Shiroadáin, Íde Ní Fhaoláin and Cepta at the launch of Mná 2016. The launch by Galway County Council of the 1916 Commemoration on New Year’s Day once again left women in a cold space. The only reference to women was a brief one to the “lady” Helena Molony (remember, revolutionaries ain’t no ladies) who was a member of Inghinidhe ne hÉireann. This in spite of the fact that there were women who contributed in one way or another to the drawing up of the 1916 Proclamation and the eventual wresting of power from the British regime. Aside from this, a group of five women who have become increasingly frustrated at the lack of gender balance in the proposed 1916 commemorations and celebrations intend changing that. Lelia Doolan, Hannah Kiely, Áine Ní Shiordáin and Eithne Verling initially tried to address the imbalance by working with the Ireland 2016 structure. 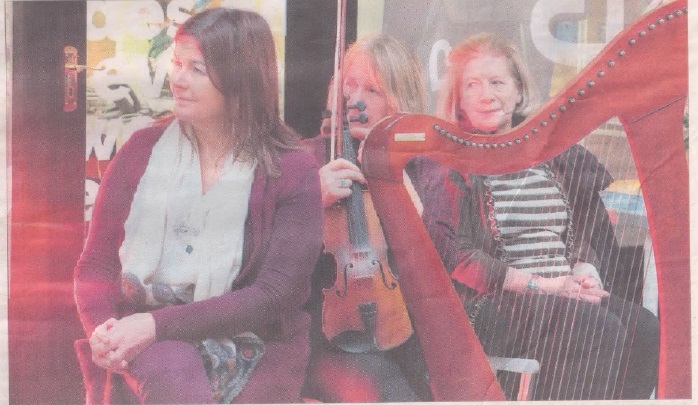 Because this failed, Mná 2016 was launched in the cornstore, Galway on Nollaig na mBan (January 6). It could not have been more different from the Galway County Council event. It was informal, informative, intercultural, authentic, downright good craic and a credit to our revolutionary foresisters. 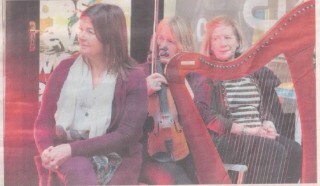 The all–female event was Mced by Lelia Doolan who introduced three of the others in their different capacities: Áine NÍ Shioradáin as singer and harpist, Kathy Mooney who is looking at women’s emblems and stories over the last 100 years and plans on having a badge designed and made for 2016, and Hannah Kiely who announced the programme for 2016 and read one of her poems the final stanza which end with these lines: “F**K it all/I want to strip off/And run naked through the city/To dance on top of the cathedral/To shout loudly in respectable rooms/To start smoking joints at meetings” – and those words encapsulate the determination and gusto which will accompany Mná 2016. An interjection was made by anti-war activist Margaretta D’Arcy who appealed to the gathering not to ignore the number of wars which affect women, children and men globally. She pointed out that in 2012 Ireland earned €2.3 billion in arms exports which she said turns “the Irish army, with its long and proud tradition as a neutral force, into a gang of mercenaries…meanwhile the Irish navy is in the Mediterranean dealing with consequences of such weaponry”. A specific topic and challenge have been designated for each month in 2016. January saw the launch of Mná 2016 with the challenge of “How to infect people to…” and it certainly did. The reason for our assembly the exculsion of 51 percent of the population – had us chomping at the bit to claim our space and honour our fore-sisters who had done the same, probably in even more challenging circumstances. February will focus on Lá le Bhríd which celebrates the life of St. Bridget, founder of a number monasteries and whose feast day supplanted the pagan festival of imbloc which heralded spring. The remainder of the year might answer that question. April will look at Women in Literature: 100 years of Creativity, May will see an exhibition of brooches and embelms historically used by women in film during the Galway Film Fleadh. An event will be organized to celebrate Refugee Day on Monday June 20 and October will focus on Nuns, Prisoners and Prostitutes 1915-2015. National Youth Day and Mental Health Promotion in August will see a soap box at the Museum Square when young women (why only young women? I thought segregation was the preserve of the patriarchy?) will be invited to anticipate challenges which may face women during the next century. The month of November may deal with some of those as Violence against Women becomes the peg for a COPE event. The Conference planned for September in NUIG may help to fulfill the mission for December which is to Leave a Legacy. Let us hope that this will be an intergenerational and multicultural event which could drill down through challenges suggested on the (intergenerational hopefully) soap box in August and plan a strategy with clear and achievable objectives for ensuring that never again will the women of Ireland – old, middle-aged and young – be excluded by our State. More details are available on www.facebook.com/Mná2016. The launch concluded with song, music, dance and general merriment. Mná 2016 abú! Women’s absence from the State commemration of the 50th anniversary of the 1916 Rising was noted by Bryan O’Connor of Ballycahlan, Gort, who was a Quarter Master for the Ballycahalan Brigade of the old IRA where Liam Mellows trained the revolutionaries. “The brave women of Cumann na mBan (cannot) be left out: Nora Lynskey, Nora Loughrey, Mary and Delia Coen, Tessie Cunniffe, Mary Ann Cloonan, Ann Deeley and Mary Fahy”. This page was added on 02/03/2016. Where I grew up, we had our own Cheltenham Festival of Racing!